by Chris Woodford. Last updated: March 2, 2019. The mighty power lines that criss-cross our countryside or wiggle unseen beneath city streets carry electricity at enormously high voltages from power plants to our homes. It's not unusual for a power line to be rated at 400,000 to 750,000 volts! But the appliances in our homes use voltages thousands of times smaller—typically just 110 to 250 volts. If you tried to power a toaster or a TV set from an electricity pylon, it would instantly explode! (Don't even think about trying, because the electricity in overhead lines will almost certainly kill you.) So there has to some way of reducing the high voltage electricity from power plants to the lower voltage electricity used by factories, offices, and homes. The piece of equipment that does this, humming with electromagnetic energy as it goes, is called a transformer. Let's take a closer look at how it works! Photo: Blast from the past: A strangely shaped transformer at the Chickamauga Dam near Chattanooga, Tenn. Photographed in 1942 by Alfred T. Palmer, Office of War Administration, courtesy of US Library of Congress. Why do we use high voltages? Photo: Coming down: This old substation (step-down electricity transformer) supplies power in the small English village where I live. It's about 1.5m (5ft) high and its job is to convert several thousand volts of incoming electricity to the hundreds of volts we use in our homes. Your first question is probably this: if our homes and offices are using photocopiers, computers, washing machines, and electric shavers rated at 110–250 volts, why don't power stations simply transmit electricity at that voltage? Why do they use such high voltages? To explain that, we need to know a little about how electricity travels. As electricity flows down a metal wire, the electrons that carry its energy jiggle through the metal structure, bashing and crashing about and generally wasting energy like unruly schoolchildren running down a corridor. That's why wires get hot when electricity flows through them (something that's very useful in electric toasters and other appliances that use heating elements). It turns out that the higher the voltage electricity you use, and the lower the current, the less energy is wasted in this way. So the electricity that comes from power plants is sent down the wires at extremely high voltages to save energy. Photo: Making large electricity transformers at a Westinghouse factory during World War II. Photo by Alfred T. Palmer, Office of War Administration, courtesy of US Library of Congress. To make a coil of wire, we simply curl the wire round into loops or ("turns" as physicists like to call them). If the second coil has the same number of turns as the first coil, the electric current in the second coil will be virtually the same size as the one in the first coil. But (and here's the clever part) if we have more or fewer turns in the second coil, we can make the secondary current and voltage bigger or smaller than the primary current and voltage. One important thing to note is that this trick works only if the electric current is fluctuating in some way. In other words, you have to use a type of constantly reversing electricity called alternating current (AC) with a transformer. Transformers do not work with direct current (DC), where a steady current constantly flows in the same direction. In a step-up transformer, we use more turns in the secondary than in the primary to get a bigger secondary voltage and a smaller secondary current. Considering both step-down and step-up transformers, you can see it's a general rule that the coil with the most turns has the highest voltage, while the coil with the fewest turns has the highest current. Photo: Typical home transformers. Anticlockwise from top left: A modem transformer, the white transformer in an iPod charger, and a cellphone charger. As we've already seen, there are lots of huge transformers in towns and cities where the high-voltage electricity from incoming power lines is converted into lower-voltages. But there are lots of transformers in your home also. Big electric appliances such as washing machines and dishwashers use relatively high voltages of 110–240 volts, but electronic devices such as laptop computers and chargers for MP3 players and mobile cellphones use relatively tiny voltages: a laptop needs about 15 volts, an iPod charger needs 12 volts, and a cellphone typically needs less than 6 volts when you charge up its battery. So electronic appliances like these have small transformers built into them (often mounted at the end of the power lead) to convert the 110–240 volt domestic supply into a smaller voltage they can use. If you've ever wondered why things like cellphones have those big fat chunky power cords, it's because they contain transformers! 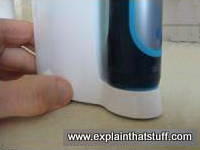 Photos: An electric toothbrush standing on its charger. The battery in the brush charges by induction: there is no direct electrical contact between the plastic brush and the plastic charger unit in the base. 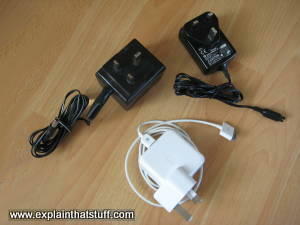 An induction charger is a special kind of transformer split into two pieces, one in the base and one in the brush. An invisible magnetic field links the two parts of the transformer together. Many home transformers (like the ones used by iPods and cellphones) are designed to charge up rechargeable batteries. You can see exactly how they work: electricity flows into the transformer from the electricity outlet on your wall, gets transformed down to a lower voltage, and flows into the battery in your iPod or phone. But what happens with something like an electric toothbrush, which has no power lead? It charges up with a slightly different type of transformer, which has one of its coils in the base of the brush and the other in the charger that the brush stands on. You can find out how transformers like this work in our article about induction chargers. If you've got some of these transformer chargers at home (normal ones or induction chargers), you'll have noticed that they get warm after they've been on for a while. Because all transformers produce some waste heat, none of them are perfectly efficient: less electrical energy is produced by the secondary coil than we feed into the primary, and the waste heat accounts for most of the difference. On a small home cellphone charger, the heat loss is fairly minimal (less than that from an old-fashioned, incandescent light bulb) and not usually something to worry about. But the bigger the transformer, the bigger the current it carries and the more heat it produces. For a substation transformer like the one in our top photo, which is about as wide as a small car, the waste heat can be really significant: it can damage the transformer's insulation, seriously shorten its life, and make it much less reliable (let's not forget that hundreds or even thousands of people can depend on the power from a single transformer, which needs to operate reliably not just from day to day, but from year to year). That's why the likely temperature rise of a transformer during operation is a very important factor in its design. The typical "load" (how heavily it's used), the seasonal range of outdoor (ambient) temperatures, and even the altitude (which reduces the density of the air and therefore how effectively it cools something) all need to be taken into account to figure out how effectively an outdoor transformer will operate. In practice, most large transformers have built-in cooling systems that use air, liquid (oil or water), or both to remove any waste heat. 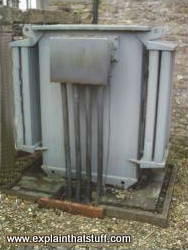 Typically, the main part of the transformer (the core, and the primary and secondary windings) is immersed in an oil tank with a heat exchanger, pump, and cooling fins attached. Hot oil is pumped from the top of the transformer through the heat exchanger (which cools it down) and back into the bottom, ready to repeat the cycle. Sometimes the oil moves around a cooling circuit by convection alone without the use of a separate pump. Some transformers have electric fans that blow air past the heat exchanger's cooling fins to dissipate heat more effectively. 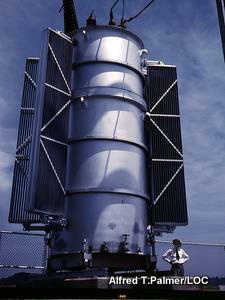 Artwork: Large transformers have built-in cooling systems. In this case, the transformer core and coil (red) sit inside a large oil tank (gray). Hot oil taken from the top of the tank circulates through one or more heat exchangers, which dissipate the waste heat using cooling fins (green), before returning the oil to the same tank at the bottom. Artwork from US Patent 4,413,674: Transformer Cooling Structure by Randall N. Avery et al, Westinghouse Electric Corp., courtesy of US Patent and Trademark Office. 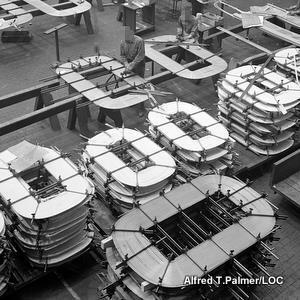 The History of the Transformer: A very good timeline from the Edison Tech Center, with some fascinating photos and videos. Transformers Design and Applications by Robert M. Del Vecchio et al. CRC Press, 2018. A detailed guide to power supply transformers. Transformer and Inductor Design Handbook by Colonel William T. McLyman. CRC Press, 2011. A detailed, practical guide to designing electrical machines using inductance. Electrical Transformers and Power Equipment by Anthony J. Pansini. Fairmont Press, 1999. Explains the theory, construction, installation, and maintenance of transformers and the different types of transformers before going on to cover related power devices such as circuit breakers, fuses, and protective relays. Transformers and Motors by George Patrick Schultz. Newnes, 1997. This book has a much more "hands-on," practical feel than some of the other books listed here; it's intended more for electricians and people who have to work with transformers than those who want to design them. Transformers & Induction Machines by M.V.Bakshi and U.A.Bakshi. Technical Publications, 2009. Explains different kinds of transformers and related electrical equipment that works by induction. DK Eyewitness: Electricity by Steve Parker. Dorling Kindersley, 2005. A historic look at electricity and how people have put it to practical use. Power and Energy by Chris Woodford. Facts on File, 2004. One of my own books, this describes how humans have harnessed energy (including electricity) throughout history. US Patent 351,589: System of electric distribution by Lucien Gaulard and John Gibbs, October 26, 1886. Gaulard and Gibbs outline how transformers can be used to step up and step down voltages for efficient power distribution—the basis of the modern electricity supply system throughout the world. US Patent 433,702: Electrical transformer or induction device by Nikola Tesla, August 5, 1890. Tesla outlines a phase-shift transformer (one that can produce a phase difference between the primary and secondary currents). US Patent 497,113: Transformer motor by Otto Titus Bláthy, May 9, 1893. A combined transformer and motor produced by one of the inventors of the transformer. 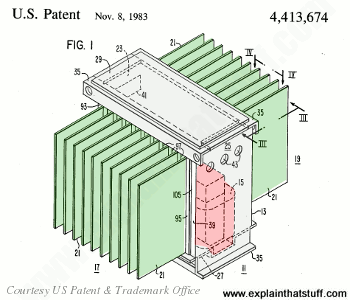 US Patent 1,422,653: Electrical transformer for regulating or varying the voltage of the current supplied therefrom by Edmund Berry, July 11, 1922. A transformer with a dial that allows you to adjust the output voltage. The Transformers: Superheroes of Electrical Inventions by Vaclav Smil. IEEE Spectrum. July 25, 2017. There are billions of transformers on the planet—in your smartphone, your laptop, your toothbrush, and elsewhere; isn't it time we appreciated them a bit more? Includes a potted history. A Drill to Replace Crucial Transformers (Not the Hollywood Kind) by Matthew L. Wald. The New York Times. March 14, 2012. If transformers are an essential part of the power grid, how can you remove them during maintenance or component failure?